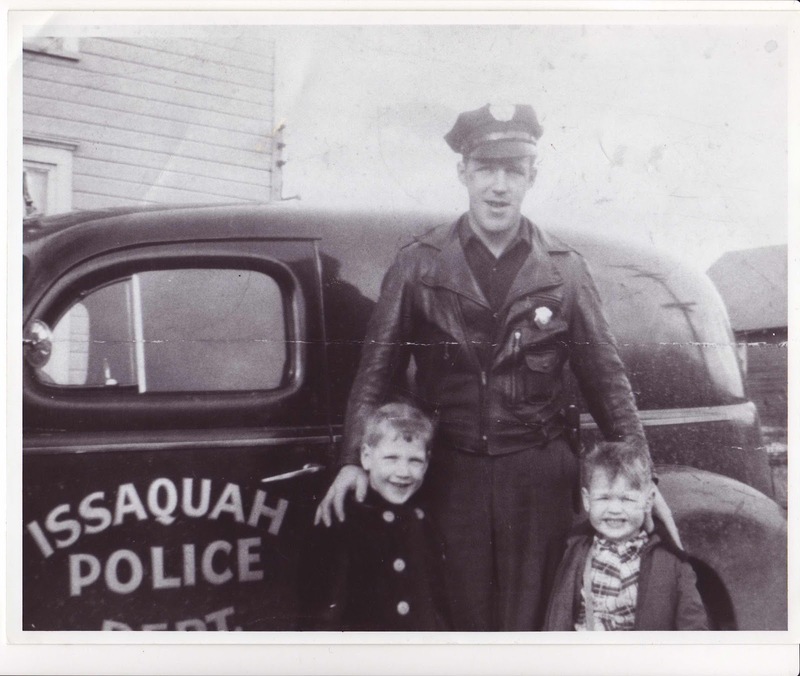 I have been a collections volunteer at the Issaquah History Museums (IHM) since the fall of 2009. This summer I started volunteering at the Eastside community Aid Thrift Shop in Kirkland. the director of the shop, Jody Orbits, showed me a textile that had been donated and asked me if I thought it was a real antique or a reporduction. 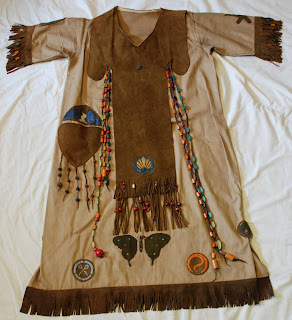 My first thought was that it had to be a reproduction because a real 1848 textile would be quite rare. I told her that I didn’t know for sure but knew people who could help authenticate it. 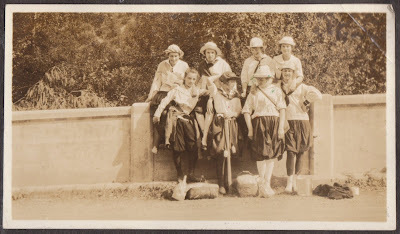 First I showed it to the members of the Seattle Vintage Clothing & Textile Club. 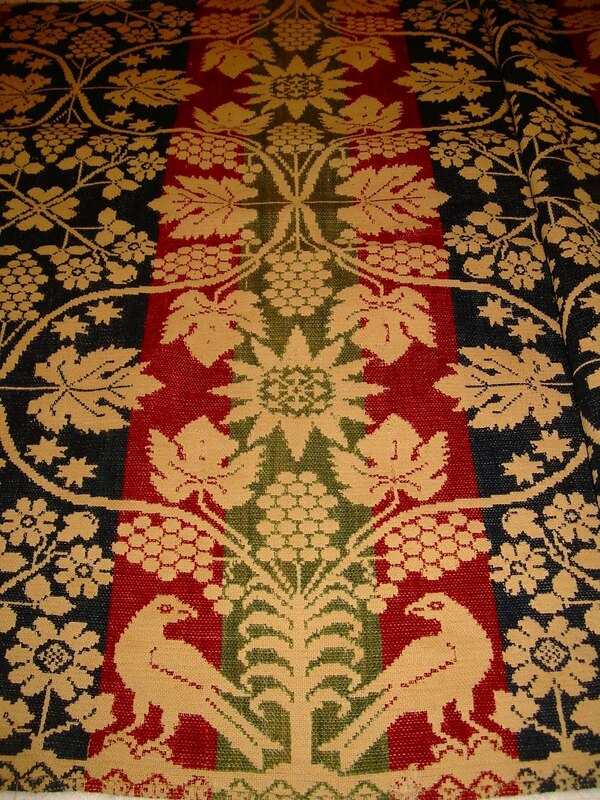 The club was founded three years ago and the membership has a wealth of historical textile knowledge. They pronounced it to be real and a great find. Then I took it to Julie Hunter, collections manager at the IHM. As she looked at the warp, the weft, the pattern, the bright colors, the condition, and the weavers mark, her face lit up like a Christmas tree. IHM director Erica Maniez was also there that day and was excited about the piece. What is this prize? It is a hand woven half-coverlet. 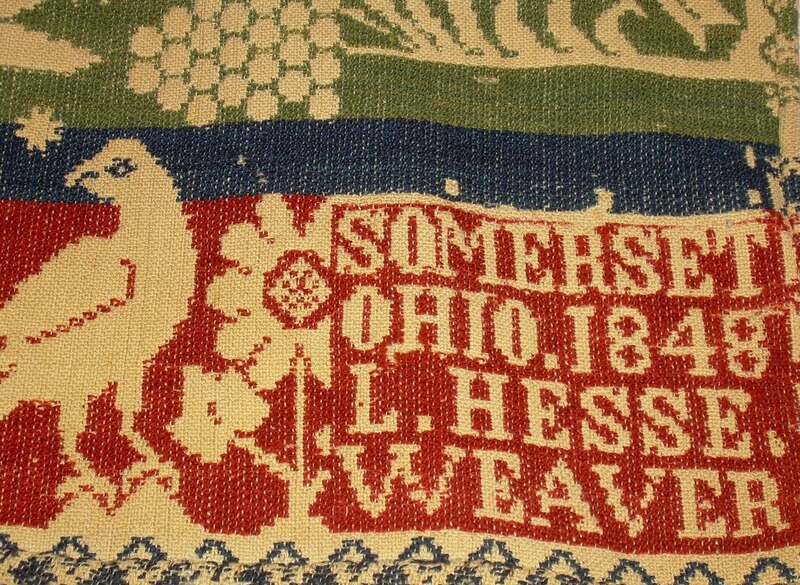 The weaver’s mark is in the bottom right corner and reads, “Somerset, Ohio, 1848, L. Hesse, Weaver.” Erica’s internet research found that Mr. Hesse was recorded in a book called American Coverlets and their Weavers: Coverlets from the Collection of Foster and Muriel McCarl, by Clarita Anderson. He was born about 1809 in Germany. 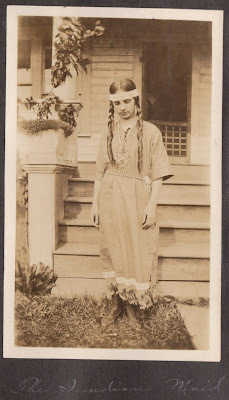 His wife’s name was Madeline and they settled in the Somerset Township, Perry County, Ohio, by about 1837, when their eldest child was born. The 1850 census listed Hesse as a 41-year- old weaver with real estate valued at $800. The book stated that he used Alsace-Lorraine dyed yarn produced by Michael Kircher. 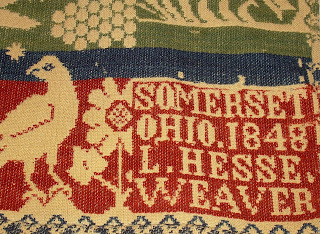 It also noted that Hesse was known to weave his mark in the corner block, including his name, location, date, usually his client’s name or initials, and “Weaver.” He was active between 1838 and 1860. Julie determined it to be a half coverlet because there are some cut threads along the selvage where it had been sewn to its other half. She knew that most coverlet looms of the period in which this was made were only about a yard wide. This piece is thirty-five inches wide (the coverlet is seventy-nine inches long.) I can only imagine what the whole coverlet would have looked like. I’m sure it was magnificent! After 163 years, it is still in excellent condition and the dyes are vibrant, although one corner has some damage. If there had been color fade, the green might have faded to brown first. The fibers are wool and cotton or linen. 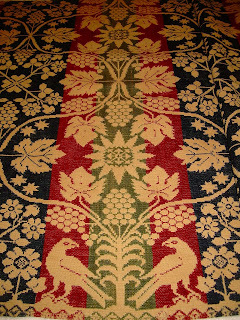 The pattern is striking with birds, vines, grapes, leaves, flowers, stars, and buildings. 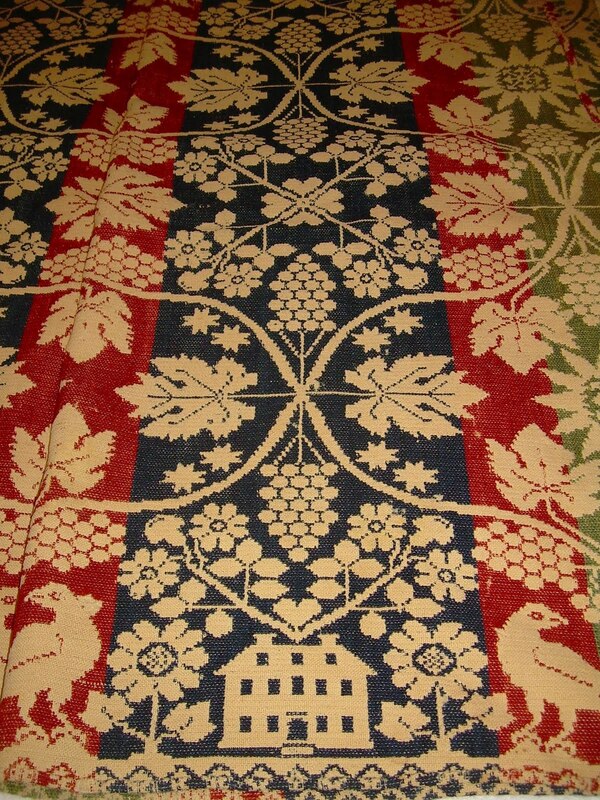 All the motifs are consistent in style with other textiles and quilts of the mid-19th century, especially those with German heritage. 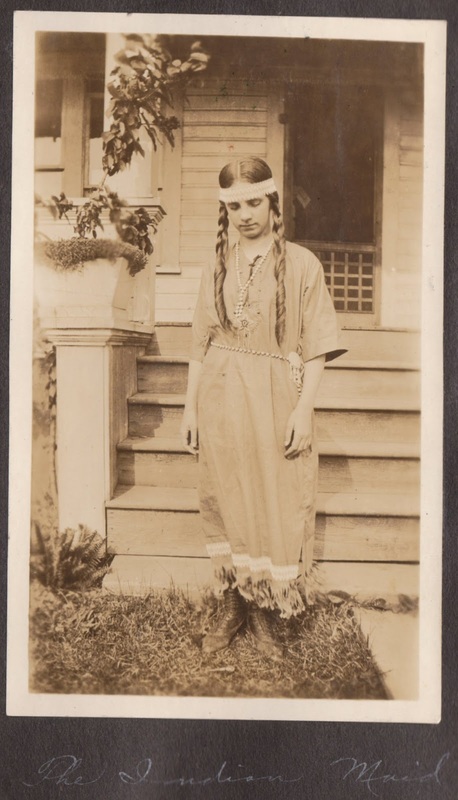 It would be wonderful to know how it got ti Kirkland, Washington. Did it come with settlers that came west of the Oregon Trail? Did a Gold Rush miner’s family bring it to the region when they settled here? 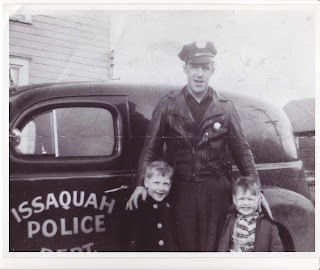 Was it ever in Issaquah? Jody Orbits said when it cae into her thrift shop, it was under some other items in a box. 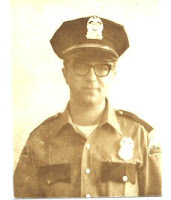 Did a family clear a deceased relative’s estate, passing on all of the old things? 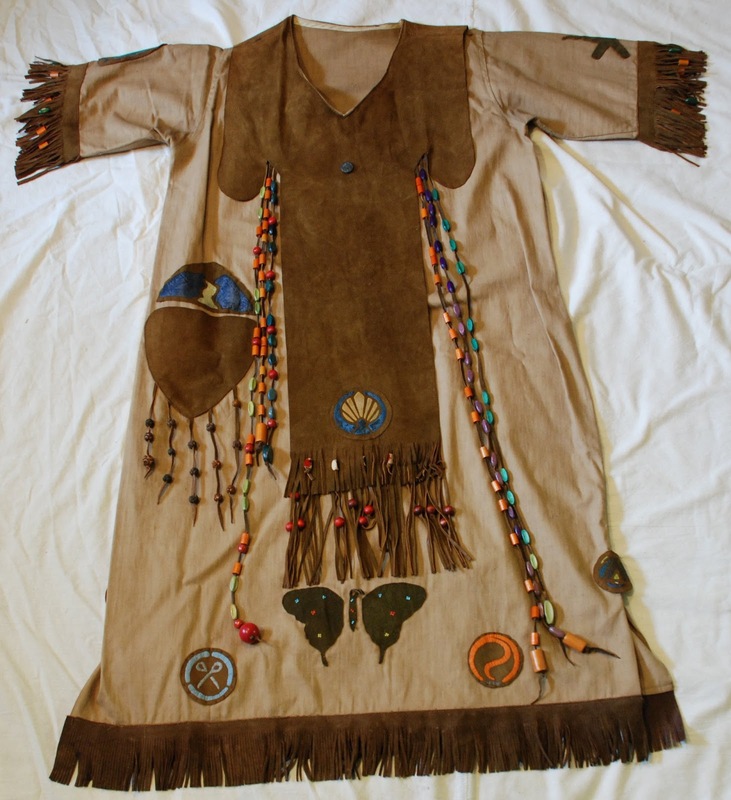 Or did the donor think it was a reproduction? We will never know but it is fun to think of all the possibilities. that we should find an appropriate museum home for it. Julie wrote to the Ohio Historical Society. 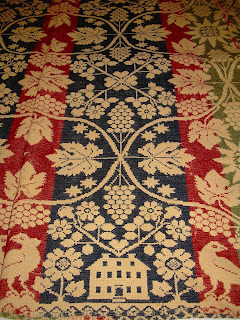 Later a curator called and said the OHS has over 400 coverlets in their collection, inluding a full coverlet woven by Mr. Hesse. He suggested that I contact the Perry County Historical Society, also in Ohio. David Snider, the Acquisitions Chairman of the PCHS, was delighted to have this half coverlet join the four already in their collection. I was sad to see it go when I shipped it to him, but it is going back home to where it belongs. I hope the Perry County museum and its audience enjoys it as much as we have. I’d like to thank Julie Hunter and Erica Maniez for their expert help and for inviting me to tell this story. Jody Orbits and I were interviewed by the Kirkland Reporter and await the publication of this story in that paper. The reporter asked if we were going to take the coverlet to the PBS Antiques Roadshow. This little treasure has touched many people these last few months and has certainly earned its fifteen minutes of fame! My girlfriend and I were hiking along 15 Mile Creek on Tiger Mountain near Issaquah on Tuesday afternoon, when I stumbled upon what looked like a large metal coil of some type. It looked like it was pretty old, especially since one end of it was buried in the hillside. It is extremely close to the old railroad grade which used to go up Tiger Mountain, and maybe a couple hundred feet away from the sealed entrance to an old coal mine. There is also the concrete foundation of a historic coal crushery, and also a coal washery (which have been recorded by the Washington State Department of Natural Resources) about a half mile from where I saw the coil. This makes me think it was part of a piece of mining or railroad equipment. I’ve been researching and trying to figure out what it was used for, and just wondered if you guys might have any insight? Each loop was roughly 20 cm in diameter. I took some pics and used my camera bag for scale so you can take a look if you want. I contacted a couple of my coworkers to see if they had any ideas, and they think it could be remnants of a trolley car wire or blasting line. If you have any ideas about what this cable might have been used for, let us know! Al Ward, a resident of Rapid City, South Dakota discovered this shingle during a 2001 remodel of his house on Mount Rushmore Road. The shingle stamped with the Preston Mill Company’s stencil had traveled from Preston to Rapid City in 1928 when the house was built. 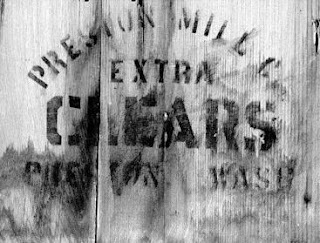 The shingle grade was Extra Clears, the best of 4 grades sold by the Preston Mill Company. An advertisement in The Issaquah Press in 1929 advertises this grade of shingles for $ 3.40 per square, delivered (presumably in the Issaquah Area). A “square” of singles equals 4 bundles of 25 square feet each which equals 100 square feet.